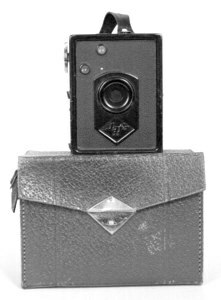 Even though this box camera is one of the most common types in Europe, it's beautiful art-deco and actually of very good quality. Over 1 million were sold and they're not made out of cheap cardboard but it's a full metal version. Many of them still work and many of them still work well. The film type to use acording to th sticker inside is "Agfa B2" but this is equal to 120 roll film so still readily available. Of course picture quality is not as good as the lens is a simple meniscus but the large 6 x 9 cm format helps a little. 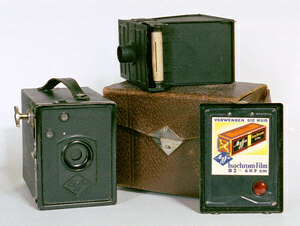 As with many box cameras, the lens is not missing but behind the shutter. When you open the camera back, carefully pull out the winding knob half way on the right hand side (seen from the back, maybe you'll have to turn the knob a little) you can remove the insert. On front of the insert is the lens, you might want to clean it. First you'll need to buy some film, since the shutter speed is between 1/30 and 1/50 and the aperture is about 11, the sunny-16 rule tells you that you'll need ISO 100 negative film for overcast days. For sunny days you might need some ISO 30 film but well, it's hard to get, just use 100 and see what happens. Ok, now that the take up spool is on top, take your new film out and break the seal. Make sure not to hold the film on the side as it might unroll itself, thus exposing your new film. Now put the new film in at the bottom.  Make sure the paper backing with the printing on is facing you, i.e. the black inside is facing the lens. Now take the paper, pull it around the back and slip the end of the paper in the empty spool which is on top. Turn the spool a few times and/or fold the paper a little in order to make sure it won't fall out. You can now insert the insert again, push in the winding knob, turn it a little and push it in all the way. When you now turn it, the film should move as well. If this is the case, close the back. Look through the red window on the back and wait for the text to appear. When a 1 (or with Kodak an l or |) appears, you're done winding and ready to take your first picture. Make sure it's not on 'Bulb' setting, i.e. the top lever should be down. Point at something interesting and pull the shutter release lever (at the bottom). Up or down is ok, the shutter works in both directions. Wind the film to the next frame by turning the winding know and wait for the number '2' to appear in the red window. Ready to take the next picture. Bring your film to your friendly photo shop or develop it yourself. You'll love your 6 x 9 negatives.